Long term care is a hot topic. 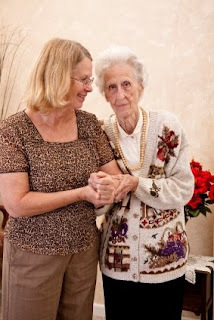 When people talk about long term care, they are generally talking about nursing homes. Policy makers put a lot of attention on nursing homes because they cost so much money. About half of nursing home care is paid out of public dollars. In California, in the setting of our state budget fiasco, the high cost of nursing home care to the state has gotten a lot of attention. But we often forget that there is another long term care "system": Family caregivers. It is important to recognize that for every person currently in a nursing home, there is at least one more person still living at home who is disabled enough to live in a nursing home. They live at home because of the great efforts provided by their caregivers. Family caregivers are the unsung heroes of the US health system. They often provide care at great personal and economic cost. Many give up their jobs so that they can care for a loved one. But caregiving can be very hard--often harder than any paying job. Caregivers have high rates of depression. Some studies suggest caregivers may often suffer consequences to their own health. The cost of replacing the labor provided by family caregivers would dwarf spending for formal home health care and nursing home care. If it were not for caregivers, our nursing homes would be overwhelmed. But the importance of caregivers does not match the attention they receive from policy makers and physicians. Medical students and residents receive virtually no training teaching them how to talk to and help caregivers. While I think we do this better in Geriatrics than in other disciplines, we also have a lot to learn. In the major journals that are read by Geriatricians, the focus on caregiving is very limited to non existent. Geriatricians need to join our nursing, social work, and Gerontology colleagues and be on the front lines of trying to learn how to better help caregivers. Sadly, the casualties of the California budget disaster include programs that are helpful to caregivers. This is unfortunate, because the limited help provided to caregivers pales in relationship to their contribution. I suspect the short term savings will be more then lost in higher levels of nursing home use. "Family care givers must be supported, because the health care system cannot exist without them...No single intervention will change the system, but small steps taken together can cover a long distance. As I enter my 10th year as a family care giver, it is hard to believe I have come this far. Today is a reasonably good day. But what about tomorrow? And next week? Hello? Is anyone listening?" Sadly, in the 10 years since Carol wrote these words, it still seems like no one is listening. Agree with Dan about the need for innovative models of caregiving for frail elders. A related issue that often comes up is how should caregivers be supported, in concrete terms. Should incentives be set in place to allow caregivers leave time from their jobs to provide care? Should they be paid for their labor of love? I'm new to these issues and am interested in what others think. Agree with all of you re. the importance for recognition and creative solutions. Most proposed solutions are grassroots based (community organizations) and/or education to assist caregivers with the skills needed to care for another. Unfortunately, many caregivers don't have the physical, cognitive, and/or financial resources to care for another. I'm seeing more families consider hospice as a back door for much needed in-home care. Sadly, medicare regulations for hospice care don't address patient needs, rather, they impose strict (and artificial) criteria that may have little to do with the patient's health/illness states nor their preferences for quality care. One way to provide support for caregivers is to make "Caregiver" a more prominent part of personal identity. I'm thinking about both the social and health care system implications. Casually, "Tell me about yourself" should be expected to include occupation, hobbies, children AND caregiver. The primary care doctor for a new parent would remind the parent to get enough sleep and ask about the kid's health, the firefighter's doctor would think about smoke exposure, shouldn't "Caregiver" be a part of a health history? The standard question would be "And are you in charge of anyone else's health care?" At all ages, Caregiver is a defining characteristic much like "Father of 3" or "Firefighter." I couldn't agree more with Dr. Covinsky's comments. In our nonprofit, short-term care SNF, we routinely see the crushing effects of caregiving on family support networks. We meet with the caregivers on admission to figure out the caregivers' levels of need. I often find myself encouraging the families to use the short-term SNF stay as respite care, so they can catch up on sleep, medical appointments and long-overdue travel plans. The current cuts in In-Home-Support-Services make it increasingly hard for our patients to return to the community, but at least we can help the families get some social, psychological and physical support during the short time our patients stay with us. I agree with JCP...there is a real need to acknowledge the "Caregiver" as thoroughly as we would the new parent or the firefighter. I am new to Hospice nursing but I am finding that depression, fatigue, and low morale among other things are common in most if not all of the caregivers I have been in contact with. For many, it has been years, or with more than one family member, (i.e. mom & dad) it seems that they just stop being who they are...who they were...and become "the caregiver". And everyone just accepts this as "normal" and that person just kind of loses him/herself in the day to day duties of care giving. They neglect themselves and their own health and yet feel guilty if they ask for help. I would not wish family care giving on anyone...and I'm a nurse! I do this for a living. God Bless the caregivers! And please remember to ask all patients if they are providing care to a loved one who is in poor health. They need to talk about it even if they don't realize it.